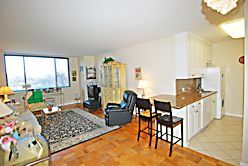 Call Us At 718-631-8867 (residence) or Contact Us By E-mail If You Would Like To Visit an Apartment. RENTED WON'T LAST! EXCELLENT CHOICE! BUILDING # 1 LARGE ALCOVE ST"U"DIO WITH SEPARATE WINDOWED SLEEPING AREA. MAGNIFICENT SUNNY SOUTH GOLF AND POOL VIEWS. Large living room with dining foyer. New wood floors. Five outfitted closets, including a large walk-in. Fully equipped, renovated opened kitchen including washer / dryer. Wood cabinets to the ceiling. Extended kitchen counter. Newly tiled bath with stall shower, vanity with marble counter. BE THE FIRST TO SEE THIS INCREDIBLE FIND! FOR RENT ONLY, $2,200, INCLUDING INDOOR PARKING. 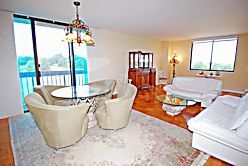 RENTED BE THE FIRST TO SEE THIS HARD TO FIND BUILDING # 2, 800 SQUARE FOOT 1 BEDROOM, 1 BATH WITH SUNNY SOUTH GOLF VIEWS! THIS LAYOUT CAN EASILY BE CONVERTED TO 2 FULL BATHROOMS. Newly renovated OPENED kitchen with cabinets to the ceiling, fully equipped, including washer / dryer. Great layout with dining foyer and spacious living room. Large bedroom. Many closets, including a huge outfitted walk-in. Lovely wood parquet floors throughout. Many custom extras! Fully renovated tiled bathroom with stall shower. MAKE YOUR MOVE AN EASY ONE WITH THIS FABULOUS FIND! FOR RENT AT ONLY $2,000/month. 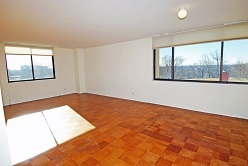 RENTED EXTRAORDINARILY RENOVATED 1,200 SQUARE FOOT 1 BEDROOM, 1 1/2 BATH CORNER! ALREADY RE-DESIGNED WITH FRENCH DOORS CREATING A SECOND BEDROOM, DEN, OFFICE, OR GUEST ROOM. PANORAMIC SUNNY SOUTHWEST EXPOSURE WITH GOLF AND SUNSET VIEWS! Enjoy this sought after layout with gracious entrance foyer and new renovation throughout. 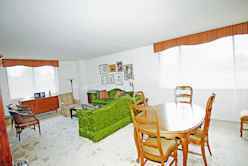 Large newly renovated eat-in kitchen with windowed dinette area, fully equipped with washer / dryer. Enjoy a large walk-out TERRACE, and two balconies with spectacular unobstructed "parklike" golf views! Tiled bathroom with stall shower. Great closets, including two outfitted walk-ins. Wood parquet floors throughout. MAKE YOUR MOVE AN EASY ONE! FOR RENT AT ONLY $3,200. RENTED THIS HARD TO FIND 1 BEDROOM, 2 BATH LAYOUT HAS ALREADY BEEN CONVERTED TO A 1 BEDROOM, 1 1/2 BATH, SO THAT IT PROVIDES A SEPARATE LAUNDRY AREA. BUILDING # 2. 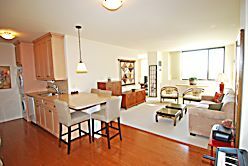 Enjoy this high floor with magnificent unobstructed panoramic golf, tennis, lake and Long Island Sound views! Renovated fully equipped kitchen. Large bedroom has its own fully tiled private bath and huge outfitted walk-in closet. Many custom extras throughout. BE THE FIRST TO SEE THIS FABULOUS OPPORTUNITY! CAN'T BE BEAT! MAKE YOUR MOVE AN EASY ONE! MOVE RIGHT IN FOR ONLY $2,200/month. RENTED FIRST SHOW! BUILDING # 1. MAKE YOUR MOVE AN EASY ONE WITH THIS BEAUTIFULLY RENOVATED 1 BEDROOM, 1 BATH! Bright and light, lovely garden and sunset views! Sought after model with spacious living room and lovely dining foyer. Beautiful wood parquet floors. Large bedroom, can easily accommodate a full bedroom set with king size bed. Four outfitted closets, including large walk-in. Newly renovated bathroom with stall shower. Fully equipped renovated opened kitchen with granite counters, cabinets to the ceiling, including washer / dryer. Low maintenance of only $956. DON'T MISS SEEING THIS GREAT VALUE! ONLY $2,500/Month. RENTED NEWEST EXCLUSIVE! 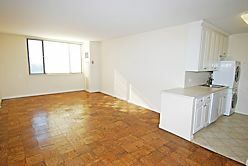 FULLY RENOVATED 1-2 BEDROOM, 1 1/2 BATH CORNER. LOW FLOOR! Building # 2. Large entrance foyer. Renovated fully equipped eat-in kitchen including washer / dryer and windowed dinette area. Large formal dining room / DEN, can be converted to second bedroom. Huge wide living room. Parquet floors throughout. Fabulous outfitted closets. Renovated bathroom with stall shower. Sunny southwest exposure with golf views. This 1,300 square foot, hard to find model, feels like a ranch house. DON'T MISS SEEING THIS SOUGHT AFTER LAYOUT. ASKING ONLY $3,000/Month. RENTED FOR RENT OR FOR SALE! MOVE RIGHT INTO THIS HARD TO FIND 1-2 BEDROOM 1 1/2 BATH, BUILDING # 2 CORNER! FABULOUS LOCATION WITH A SUNNY SOUTHEAST EXPOSURE AND MAGNIFICENT GOLF AND PARKLIKE COURTYARD VIEWS! Make your move an easy one with this spacious 1,200 square foot layout! Lovely renovated eat-in kitchen, with windowed dinette area, fully equipped, with newly updated appliances including Bosch washer / dryer. Large formal dining room / DEN has lovely a built-in wall unit. Can easily be converted to a second bedroom. Master bedroom suite has an enlarged outfitted walk-in closet, and private tiled bath / shower. Includes indoor parking. ENJOY THIS SOUGHT AFTER LAYOUT. WON'T LAST! CAN'T BE DUPLICATED FOR ONLY $3,200/month. 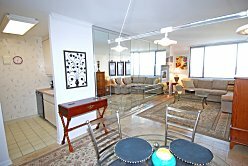 UNIQUE OPPORTUNITY TO ENJOY DRAMATIC UNOBSTRUCTED CITY SKYLINE VIEWS FROM THIS HIGH FLOOR STUDIO! Large living room with parquet floors. Renovated kitchen and marble bath. 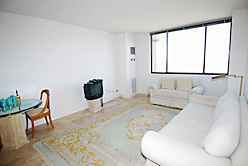 Fully furnished, totally turn key makes this hard to find model your perfect pied-a-terre. Fabulous sunny west exposure with panoramic golf and sunset views. Includes indoor parking. We have a selection of rentals of all apartment sizes--Studios, 1 Bedrooms, 2 Bedrooms and 3 Bedrooms. Please call us at 718-631-8867 for more detailed information. Please call us at 718-631-8867(residence) to find out about our new listings or click our banner below to contact us by e-mail. Copyright © 2000 - 2019 [Annette & Glenn Kroll] All rights reserved.